How (not to) maintain educational campuses! For all the talk about Swacch Bharath and the necessity for cleanliness in public spaces, we appear to be doing very little by way of addressing the most impressionable target audience – students. Most college campuses, in particular the ones run by the Government, present a sorry picture of neglect and bad maintenance. Given the general squalor that abounds, how do we expect our students to grow up to be responsible citizens? Take the Presidency and Queen Mary’s College campuses. Both are in terrible shape with very little attention being paid to their upkeep. It is a wonder that students continue to study at these places. Perhaps they do not have any choice in the matter. The hostels are in worse shape and the protests by students staying in them are regular affairs. The Teachers’ College, Saidapet lost at least a couple of its heritage buildings to Metro Rail and what is left is dilapidated. But this is not all. It also appears that the administration is forever trying to build upon whatever empty space that is available in these campuses, thereby destroying the very atmosphere that such institutions are supposed to have. The Lady Willingdon Institute has a new block built, thankfully in sympathetic style, alongside the older building. The University of Madras’ south campus in Kotturpuram has managed get rid of whatever tree cover it had by way of putting up new structures. The latest to join the long list of casualties is the Arasu Isai Kalluri aka Government College of Music located at Brodie’s Castle, on the banks of the Adyar. This has for long been a sylvan campus, despite its rather indifferent maintenance. The college is housed in the main building, the offices of the Vice Chancellor of the Tamil Nadu University of Fine Arts are in an annexe and there is also a splendidly maintained but sparingly used Tagore Film Centre, owned by the National Film Development Corporation. A vast amphitheatre, built a decade ago, occupies yet another part of the campus and is completely in disuse. The whole place has a sense of peace and quiet and students practice their art in the open apart from the classrooms. All this atmosphere will soon be destroyed if the Government has its way. 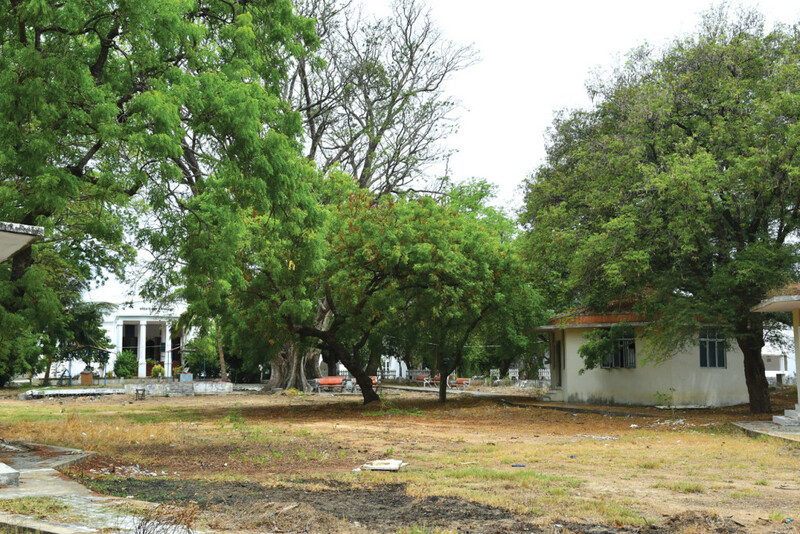 The Chief Minister has announced in the Assembly a plan to lay a road through this campus so that Greenway’s Road can connect to Durgabai Deshmukh Road on the Adyar. Ostensibly meant to ease congestion at the Greenway’s Road junction, its prime purpose is to allow Ministers and senior Government officials in the area faster access to their residences. The plan, if implemented, will mean vehicles will use this as a road to reach Adyar Bridge. The entire campus will be destroyed and the college will be scarcely able to function. This is also seen as a means to get the college to leave Brodie’s Castle. The Government has allotted 32 acres of land in Sholinganallur for the institution, but it is reluctant to move as the faculty feels students will be put to great hardship if they have to travel that distance on a daily basis. It is understood that both the Fine Arts University and its neighbour, the MGR Sathyabhama College, have protested against this road plan by the Government. It is not clear if such representations will have any effect. 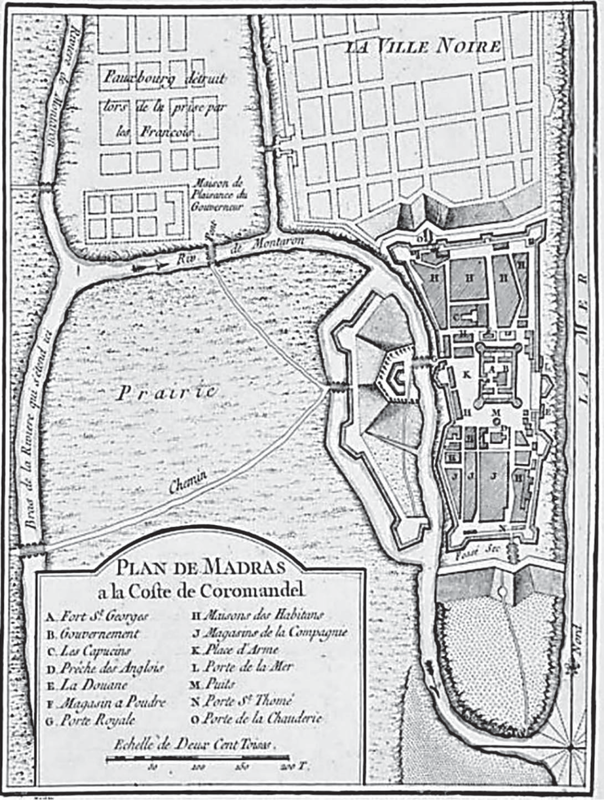 For the record, Brodie’s Castle is also recognised as a heritage structure by the High Court of Madras. But such considerations have meant little for even larger and more prominent buildings. The College and its present home stand threatened and there is very little that can be done about it in the face of official apathy. It is disappointing that Chennai City, which was 235th out of 434 cities of India in the 2017 Report of Swachh Survekhsan by the Ministry of Housing and Urban Affairs (MoHUA), has failed to improve upon its ranking in the 2018 report covering 4041 cities. The full report for 2018 is yet to be released, but, when released, it would only help us to know why we failed and not whether we did. A scientifically designed tool kit for the Survey also doubles up as a detailed guideline for action by public agencies at local and control levels to raise and maintain cleanliness standards. The surveys of 2014 and 2017 show that of 434 cities covered only three cities each in Tamil Nadu and Andhra Pradesh and each one in Karnataka and Kerala were within first 30 ranks – and only one each within the first ten. Mysuru consistently retained its first rank in 2104 and 2016 and ranked as the fifth cleanest city in the country in the 2018 Report. Andhra Pradesh has the distinction of being the most responsive among the southern states, with three of its cities moving upwards from report to report – Vishakapatnam moving up from 44th rank to 5th, Hyderabad from 50th to 19th and Vijayawada from 46th to 23rd. Tamil Nadu has nothing similar, to claim. Trichy and Coimbatore are within the first 20 ranks but Chennai, as the capital of the State, is nowhere. 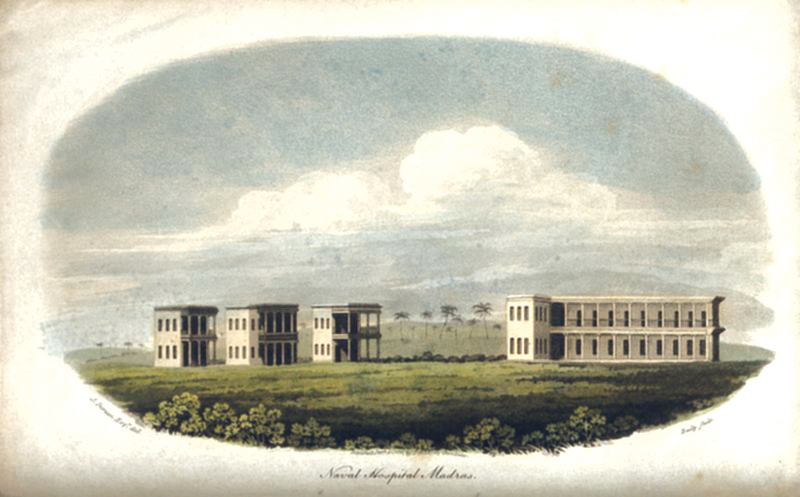 The Naval Hospital in 1811. Naval Hospital Road is a thoroughfare that connects Vepery with Poonamallee High Road, terminating just opposite the Government College of Fine Arts. There is, however, no such institution in its vicinity. What extends to one side is a long, low-slung building with a sloping roof. This now houses the Government Medical Supplies Depot. And it holds within it the history of the long-vanished Naval Hospital. Once the residence of the Director of Medical Supplies, now empty. Is this a survivor from the Naval Hospital? An Unlikely Chemistry* by Dr. S. Krishnaswamy, documentary and television film-maker of repute, who hit the headlines in the late 1970s with his four-hour magnum opus Indus Valley to Indira Gandhi, tracing the 5,000 years of history and heritage of India on celluloid, started as the biography of his wife Dr. Mohana Krishnaswamy, but ended up as an autobiography of a couple. It is the story of the unlikely chemistry between a scientist and a film-maker who battle personal issues and external challenges and go on to build a life on their own terms. 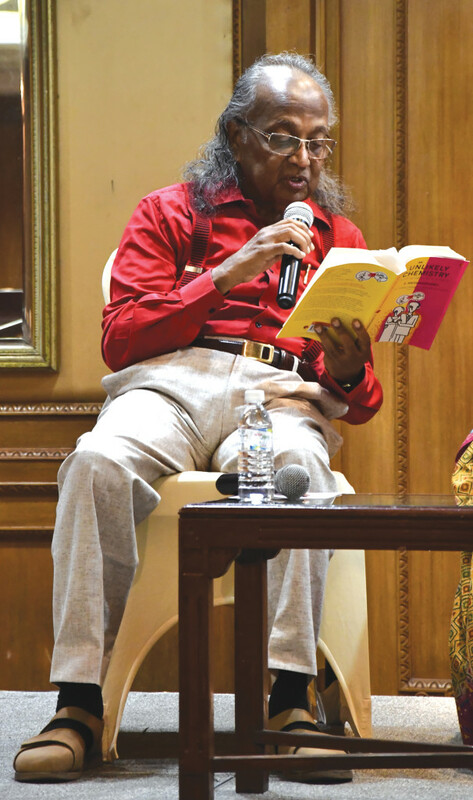 It is also the story of the trials and tribulations, the joys and sorrows that the couple together faced during 48 years of their marriage.